In this tutorial, I will show you how to setup a Shadowsocks server on Amazon EC2. 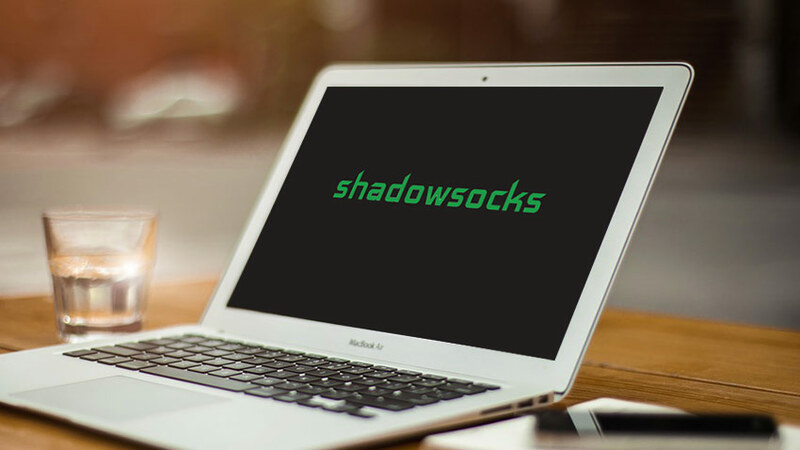 We also have a tutorial on setting up a Shadowsocks server on DigitalOcean if you are interested. Please note: this is a quite advanced tutorial for technical guys (or gals) who feel comfortable with doing things such as using Linux commands, setting up linux servers, using SSH and using the vi editor etc. It’s also required that you already have a Amazon Web Services (AWS) account. In terms of the cost, since AWS offers a 1 year free tier for new EC2 micro instances, if your AWS account qualifies for the free tier, you can host your Shadowsocks server on AWS free of charge for a whole year. Otherwise, the regular cost would be around $16 per month. If you think the cost is too high, you can also try hosting a Shadowsocks server on DigitalOcean for $5 per month. If you are not a tech-savvy person and you just want to find a way to visit blocked websites from China, I’d recommend you take a look at this list of VPNs that work well in China. If you are looking for a paid Shadowsocks service, you can try 12VPN, which offers Shadowsocks as part of their VPN plans. Part 1. Creating a AWS EC2 Instance. In this step, we will create a AWS EC2 micro instance running Ubuntu. For launching new instances, AWS allows you to choose from a number of server locations. Since I assume you are mostly interested in using Shadowsocks in China, I’d suggest choosing the Asia Pacific (Tokyo) region because it’s probably the best international EC2 server location for China. First, let’s go to the AWS Management Console and log in with your AWS account. After that, you need to select the Tokyo region from the dropdown menu in the top navigation bar. Then you click on the “EC2” link (on the upper left position on that page). 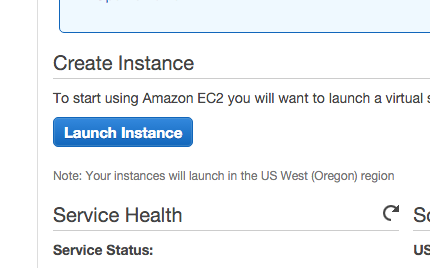 Once you are in the EC2 Management Console, click the blue button “Launch Instance”. Then you will see a list of Amazon Machine Images (AMIs) for you to choose. 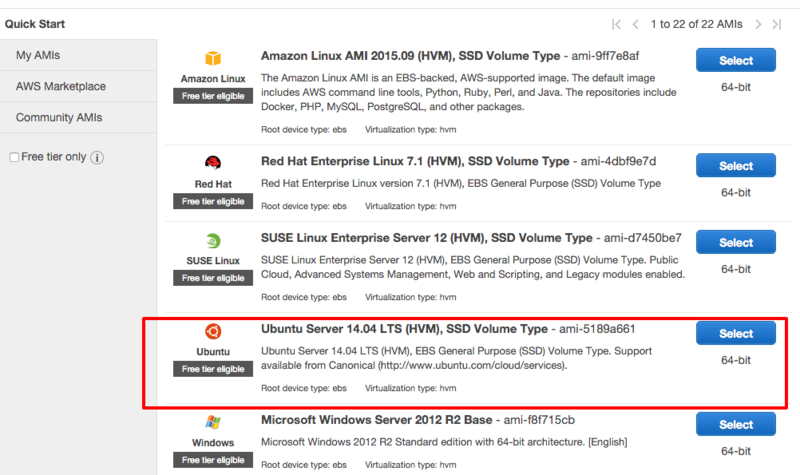 Find the one titled “Ubuntu Server 14.04 LTS (HVM) and click on “Select”. (If you are reading this article when there’s already a newer version of Ubuntu server available, just choose the newer one). Then you will be asked to select the instance type. Select the first one, t2.micro, because it’s the cheapest one and it’s good enough or a Shadowsocks server. Also, it might be free tier eligible, which means you can use it free of charge for up to 1 year! Let’s create a new security group called “shadowsocks”. You can click on the “Add Rule” button to add new rules. Just make the group have the following configuration. Then click on the blue button down below labelled “Review and Launch”. Then you can click on the blue button labeled “Launch”. Then you will see a popup window like the one below that asks you about key pair. If you have already created a key pair before and that key pair is still available on your computer, you can select “using existing key pair”. Otherwise, you can create a new key pair. I will skip the key pair creation step here. Make sure you save your new key pair in a secure place. 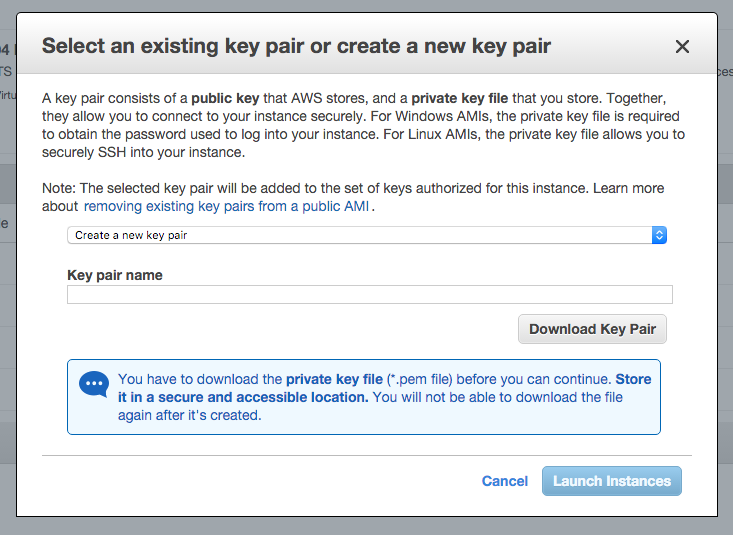 After you’re done with key pair, click on the blue button “Launch Instance”. If everything is fine, you will see a message saying ‘Your Instance are now launching”. Click on the “View Instances” button down below to see your newly created instance. You will see your new instance listed on that page. If you click on the checkbox to the left of that instance, you will see detailed information below the instance list, such as Instance ID, Private DNS, Private IPs etc. Among those, we will need two pieces of information: Public IP and Private IP. Copy and paste these two IPs for later use. Although the Public IP will work, I’d suggest you get a new Elastic IP and use that IP instead of the default public IP for the new server. That’s because in the future if you stop the instance and then start it again, you might find the public IP address has changed, and then you have to change your Shadowsocks client’s configuration accordingly. Therefore, a static IP will will be better. because it’s stable. To setup a elastic IP, click on the “Elastic IPs” link under “Network & Security” in the left navigation bar in the AWS EC2 console. Then click on “Allocate New Address” and then you can associate the new IP with your new instance. From then on, use this new IP as the Public IP for the server and don’t use the public IP that come with your new instance. With the checkbox for our new instance checked, click on the button on the top of the page labeled “Connect”. You will see a popup showing you detailed information on how to connect to your instance using SSH. You need to replace “your_private_ip” which the private IP address of your EC2 instance (NOT the public IP!) and replace “your_passwd” with a real and better password. If there’s no error message in the log file, you are OK. In the future, if you want to stop the server, just run “ssserver -c /etc/shadowsocks.json -d stop”. If you want to restart the server, run “ssserver -c /etc/shadowsocks.json -d restart”. At this point, we’re almost done! If you use a Shadowsocks client to connect to our newly created server, make sure use the public IP (Not the private IP you just added to the configure file) and make sure specify the correct port number (8000 in our example), as well as the correct password. If everything is correct, you will see Shadowsocks working! But let’s not declare success yet. Let’s do some server optimization to speed up our Shadowsocks server. Now we have a more powerful server. But let’s not stop here. Let’s do some more tweaking to make our Shadowsocks server super-fast! Update: As of early 2016, ServerSpeeder has stop new user registration as well as new installations. Therefore, this part is no longer relevant. Please skip it and go to Part 5. To speed up our Shadowsocks server, let’s use a service called ServerSpeeder (锐速). Currently its website is in Chinese, so you might need to figure things out if you don’t understand Chinese. You need to register a free account on that site. Another thing is, you want to double-check to make sure your server’s system is supported by SeverSpeeder. To do so, you can check ServerSpeeder’s list of supported systems. When you run the installer, you will be asked about your email address and password. Just use the email address and password you entered when signing up ServerSpeeder’s free account. During the installation, if it turns out that your Ubuntu server is not supported, you will see an error message and you might consider changing your kernel version to one that’s supported by ServerSpeeder and then run the installer again. Also, during the ServerSpeeder installation, you will be asked about a few options, just go with the defaults except for this one: “Auto load ServerSpeeder on linux start-up [n]”, for which you should type in “y” to answer yes. Finally, we are done with our Shadowsocks server installation and optimization. Now we’ve reached the easy part. We need to use a client to connect to our new Shadowsocks server to enjoy a better Internet experience. There’s not much to talk about for this step. Just visit Shadowsocks.org’s client download page to download a client and install it on your system. Then you can start using Shadowsocks. You should see htcp in the output from that command. This article is provided to you by VPNDada.com, a website dedicated to help China Internet users find reliable VPN services to bypass Internet blocking. We are based in China and we test, monitor and review VPN services from China. We have a regularly updated list of Best VPNs for China if you are interested. This entry was posted in Shadowsocks, VPN Guide and tagged guide, shadowsocks. Bookmark the permalink.